Ocean, originally uploaded by bill kralovec. We had a lovely stay at the Hotel Danubia in the Silver Lake Resort. The resort is just outside of Veliko Gradište, The town is located about an hour east of Belgrade on the banks of the Danube, Dunav in Serbian. It is a new hotel and reasonably priced. 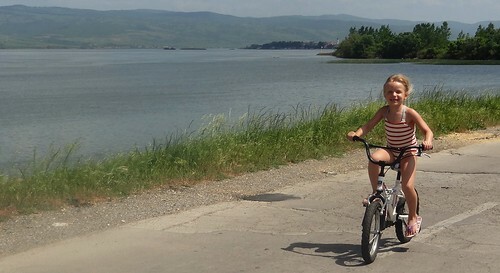 We took our bikes and there are many great biking trails, perfect for kids. We rode to main plaza in Veliko Gradište twice. 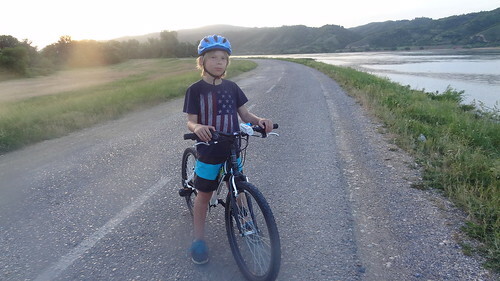 The town is quite poor and nothing spectacular, but the bike trail is safe, and there is a really nice park for kids. The Danube itself is quite wide and really fresh. It made me remember the summers on the lakes of Upper Michigan. We also did some swimming, frog catching, and eating some fresh perch. Today on the way home we stopped at the Ram Fortress and climbed around it a bit. Typical Serbia, no signs, no interpretive materials, just an old abandoned fort the kids could climb around. Awesome!!!! I highly recommend a visit for a weekend get-a-way from Belgrade. Owen makes a “dagger” 3 from the corner! Shinsaibashisuji in central Osaka is always bustling, even on a Sunday evening. Happy New Year from the Kralovec family! Best wishes for a healthy, prosperous and joyful 2019! I loved playing football with my sons, brother and nephew on Christmas afternoon!